During a trip to Circuit Mont-Tremblant last month, EMS Race Team driver Jim Weiland split the driving duties with his coach, Conrad Grunewald. The duo managed to bring home first in the Enduro, one of the many accomplishments for the Cornerstone of Hope / EMS+ / Ferrari of San Francisco Ferrari 458 Challenge “Erin” since coach Grunewald got on board. This past weekend, Grunewald also helped Weiland navigate Erin through some wet and competitive races back at Mont-Tremblant, as the 2015 Ferrari Challenge season continued. Conrad got his start in road racing back in 2000 at a racing school in California, taking a 3-day racing course. After the course he got a job as a mechanic at the racing school where he spent quite a bit of time driving the 2-liter open wheel formula cars. In 2002, he raced in the school’s open wheel championship and was hired as an instructor for the school. By 2003, Conrad was driving the data car for the racing school’s race series. In 2004, he received his first opportunity in the drifting world where he was one of 12 drivers representing the USA in the USA vs Japan D1 drift event in Fontana, CA. Conrad has competed the last 10 years in Formula Drift and is currently driving a 900HP Chevy Camaro in the Formula Drift Championship. Although Conrad spent the majority of his time focusing on drift, he also spent plenty of time racing in IMSA and coaching in Ferrari Challenge. He currently works with the EMS Race team by helping Jim Weiland setup their 458 EVO Challenge car as well as hone his driving skills. 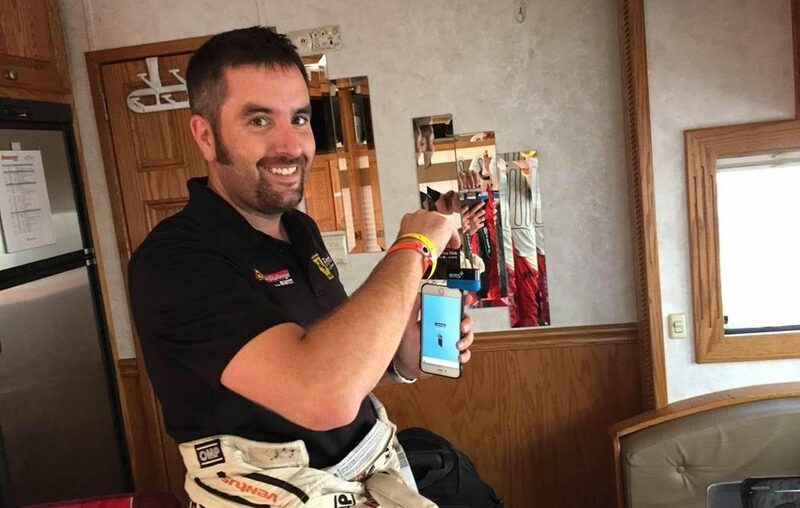 Not only is Grunewald part of the EMS team on the track, but he also uses EMS+ to accept payments off the track as well. It’s a mobile payment method that Grunewald said has served him well throughout his time as an instructor and coach. To keep up with Conrad on and off the track, check out his Instagram page and follow on Twitter.